-For only the second, and final time in the first round of the 2015 Stanley Cup Playoffs, we have a game seven. The winner of tonight’s Detroit–Tampa Bay game will move on to play the Montreal Canadiens in the Eastern Conference Semifinals. This series has been a tough one to get a read on. 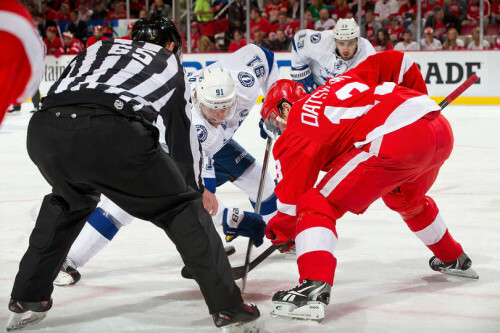 It seems as if it’s all or nothing for the Lightning offense and the Red Wings defense. Either the Wings and 23 year old goalie Pete Mrazek completely thwart Tampa’s attack, or the Lightning (mainly rising star Tyler Johnson – six goals, one assist and two of their game-winning goals in the series) barrage Detroit on the scoreboard. The big headline going in to tonight’s deciding game is the one-game suspension of Detroit’s top defenseman Niklas Kronwall for this hit on Nikita Kucherov. It’s a hit that makes me want to watch the ‘Scott Stevens Top 10 Hits’ video on YouTube, but that kind of hit won’t fly in today’s NHL. If you target the head, you’ve made it an easy decision for the NHL’s Department of Player Safety on how to proceed with a suspension. Losing Kronwall means Detroit will be without their top defenseman. Losing fellow defenseman Marek Zidlicky for tonight’s game (out with an undisclosed injury) magnifies the loss of Kronwall even more. It hurts their blueline and their power play units (Kronwall quarterbacked the first power play unit; Zidlicky QB’d the second unit).